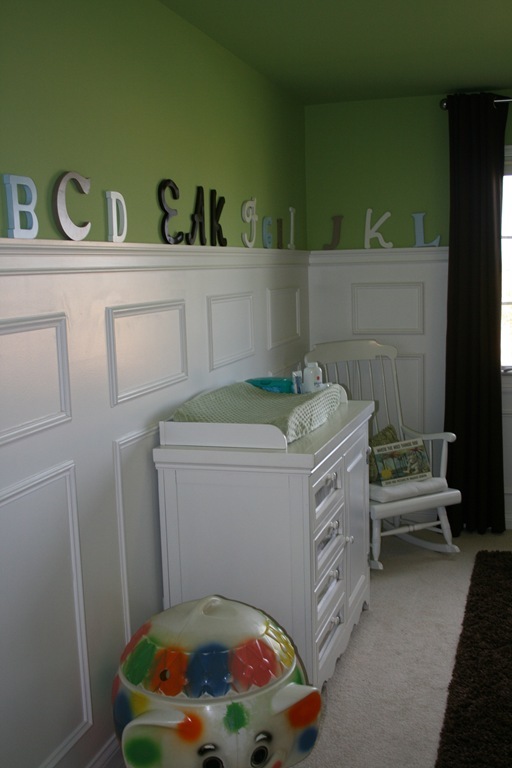 Baby Edward’s room starts out with a pop of color of sage green walls with white chair rail and molding 5 feet from the floor instead of the traditional 36” giving the room more height. 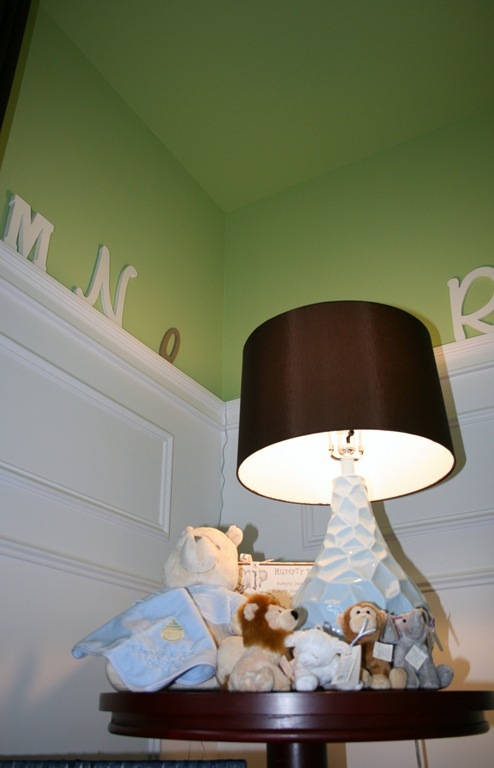 We brought in texture with the shag rug, window coverings and a textured light fixture. 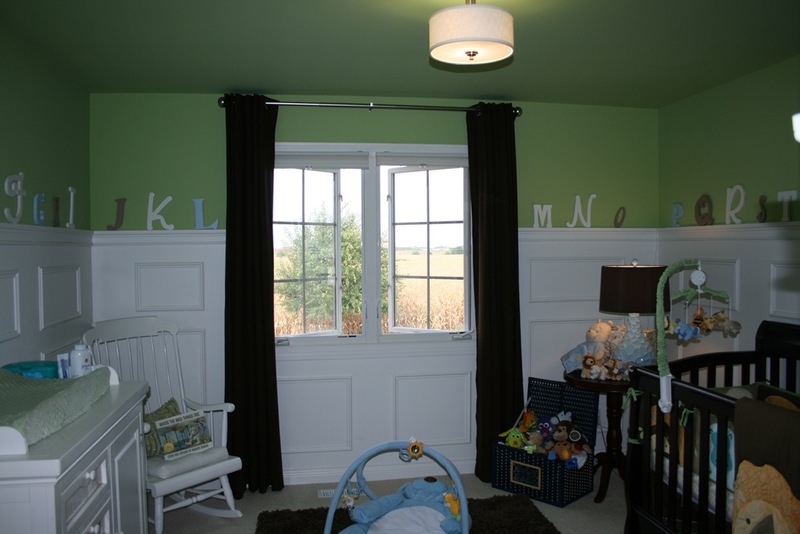 Accessories include jungle themed wall hangings and white alphabet lettering around the room. 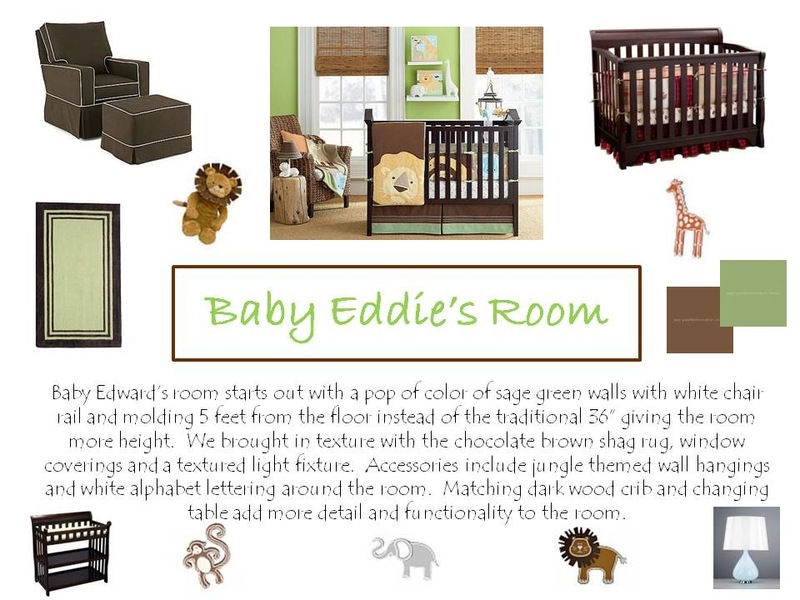 Matching dark wood crib and changing table add more detail and functionality to the room. 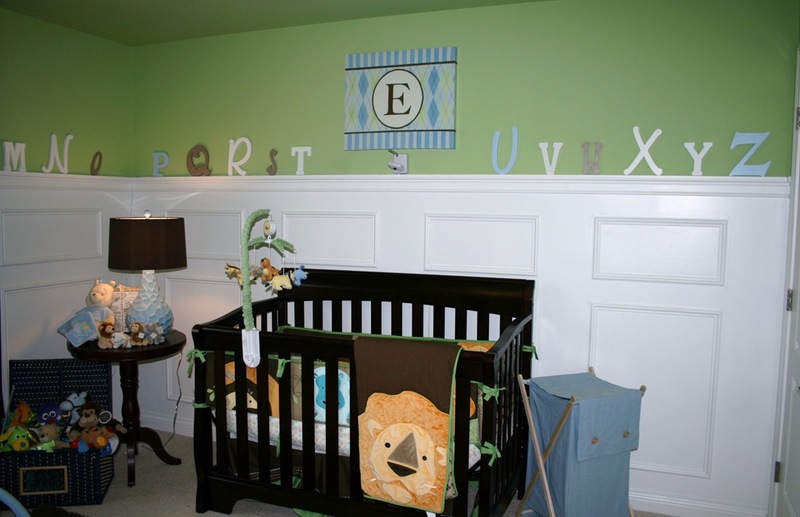 Above is our deco board of Baby Edward’s room. We came up with an electronic design plan and implemented it. We made a few changes to the original plan. We put in a white rocking chair that was handed down, price free. 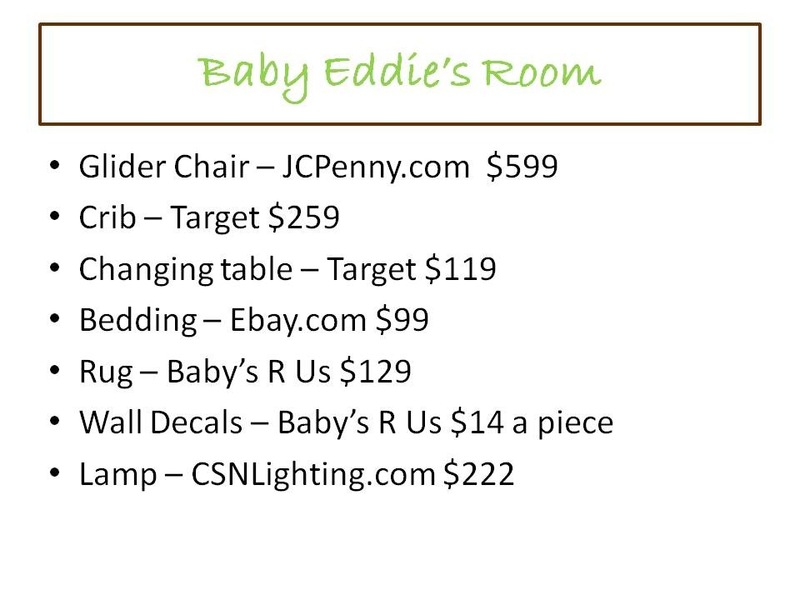 Mom and dad already had the white changing table, saving them a little more on decorating costs. We found a brown shag rug on clearance and purchased the “E” board at Home Goods. Also, we found a cheaper lamp that was similar at Home Goods and purchased a simple white round shade ceiling light at Lowe’s for $79. See our changes in the photo’s below. This is an overall photo of the room. We purchased the dark cherry wood crib from Target, brown panels at Bed, Bath and Beyond, and the Amy Coe bedding at Babies R Us. The blue and chocolate brown lamp was purchased at Home Goods and the brown rug on clearance from www.walmart.com for only $40. We had a chair rail installed at 60” instead of the normal 36” which gave the room a little more detail and height. 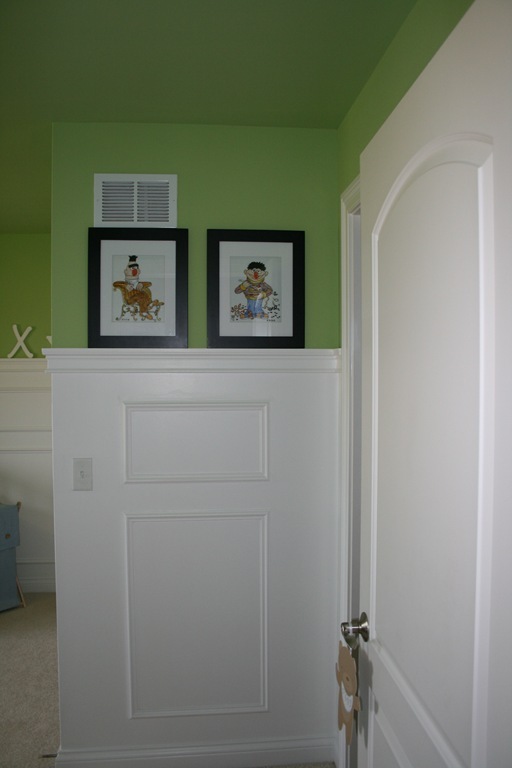 We installed the picture molding or wainscoting for more detail and painted it a nice crisp super white. Above we found the textured lamp with a chocolate brown lamp shade at Home Goods for $59.99, much better price than in our design plan. Mom and dad already had a little round side table and we added a few little rattles and a keepsake box. 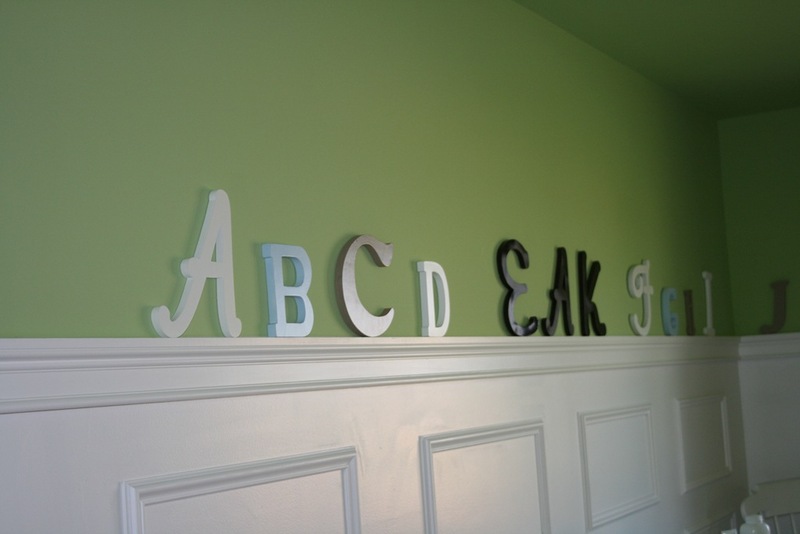 We took letters purchased at JoAnn Fabrics for a few dollars a piece and painted them the colors of the room, baby blue, brown, green and white. 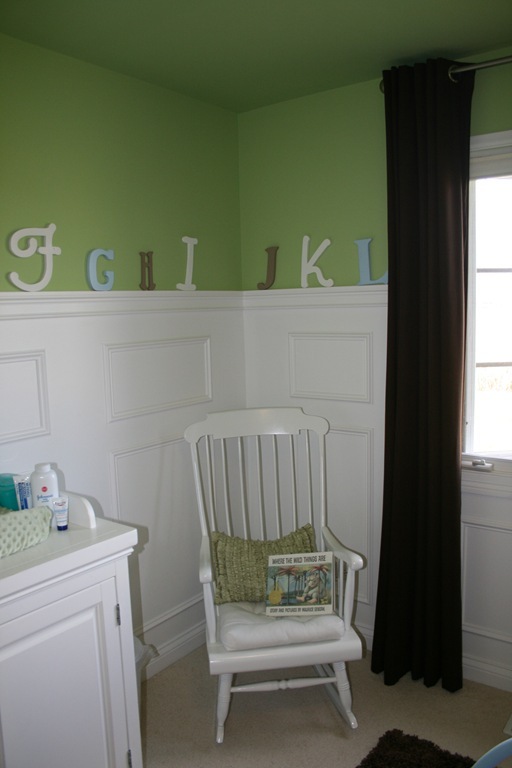 We put his initials in dark brown above his changing table. We also brought in old hand me down items from mom and dad’s childhood. Here we have an old elephant toy box that used to house all of Eddie’s fathers toys when he was a little boy. Here we have Burt and Ernie photos what were given to dad by his Aunt in 1976 and saved for just this occasion adding a special touch to the room. Here we have an old rocking chair that was given to Eddie’s grandmother when Eddie’s mom was born. She used to rock her baby girl in this chair and handed it down so now mom rocks baby Eddie in the chair. We just sanded it down and painted it white and purchased a white seat cushion at Ikea for $4.99. Adding our favorite childhood story sets the mood for some nighttime snuggling.